I created these "Angel" earrings for a recent show I did, and am just now getting around to including them on my web site (shame on me)! 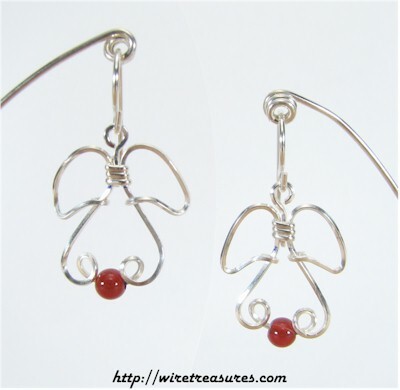 These whimsical angels will stay close by, guarding your left as well as your right (ears), all the while carrying Carnelian beads, just in case... If you'd like a different bead, just e-mail me and let's see what I have available. This design is also available without beads. These earrings are representative of the ones you will purchase. Since all my wire earrings are hand-crafted, no two pair of the same design will be identical. Small variations in size and design are inevitable. These earrings are available with either French wires or ball posts. The "angels" measure about 3/4" high and 3/4" wide, irrespective of attachments. You are visitor number 4,136 to this page.